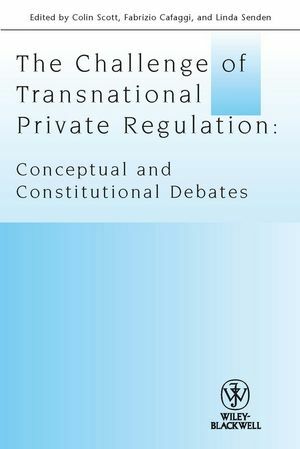 The Challenge of Transnational Private Regulation: Conceptual and Constitutional Debates presents an extensive treatment of the constitutional dimensions of transnational private regulation, including its sources of power and modes of accountability. Colin Scott is Professor of EU Regulation and Governance, University College Dublin, and Co-Editor of Law and Policy. Fabrizio Cafaggi is Professor of Comparative Law, European University Institute, Florence, on leave from the University of Trento. Linda Senden is Professor of European Law, Tilburg University, the Netherlands. She has published extensively on the use of soft law in the context of the EU. 1. The Conceptual and Constitutional Challenge of Transnational Private Regulation (Colin Scott, Fabrizio Cafaggi, Linda Senden). 2. New Foundations of Transnational Private Regulation (Fabrizio Cafaggi). 3. Neither ‘Public' nor ‘Private', ‘National' nor ‘International': Transnational Corporate Governance from a Legal Pluralist Perspective (Peer Zumbansen). 4. The Crystallization of Regulatory Norms (Donal Casey, Colin Scott). 5. Privatized Sovereign Performance: Regulating in the ‘Gap' between Security and Rights? (Fiona de Londras). 6. Competition Law and Transnational Private Regulatory Regimes: Marking the Cartel Boundary (Imelda Maher). 7. The Meta-regulation of Transnational Private Regulation (Jacco Bomhoff and Anne Meuwese). 8. Public Accountability of Transnational Private Regulation: Chimera or Reality? (Deirdre Curtin, Linda Senden).